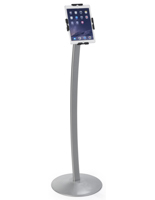 This Acrylic Stand for iPad is a Great Addition to Any Retail Store or Tradeshow Display. This Digital Kiosk Display is Affordable. This Acrylic Stand for iPad has a Modern Look for any Setting. Stand is constructed of 3/4" thick acrylic and enclosure is constructed of 1/2" thick acrylic for a durable and sleek display. Black acrylic accents on the enclosure allow users to expose or hide the tablet home button. Foam pads included for inside of the enclosure to prevent scratching of the tablet. Accomodates 2nd, 3rd, and 4th generation iPads. This acrylic stand for ipad is an innovative way to communicate with customers. When store personnel are occupied, these tablet displays provide a resource to find knowledge about products and services offered. This acrylic stand for ipad comes with everything necessary to set up. 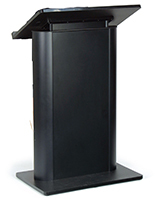 Users can mount the enclosure in portrait or landscape depending on the presentation. With this item, users permanently glue the adapter plate to the tablet and then tether the security cable to a permanent object. This acrylic stand for ipad is made for commercial use. These tablet mounts boast a stand made of 3/4" thick acrylic and the enclosure constructed with 1/2" acrylic. Interactive point-of-sale displays are rapidly gaining popularity in commercial establishments. 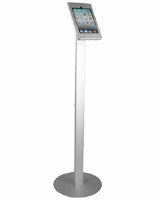 This Apple® tablet display, acrylic stand for ipad that is often found in retail stores does not take up too much floor space. Foam pads are included with the enclosure to prevent scratching of the back of an expensive touch-screen device. 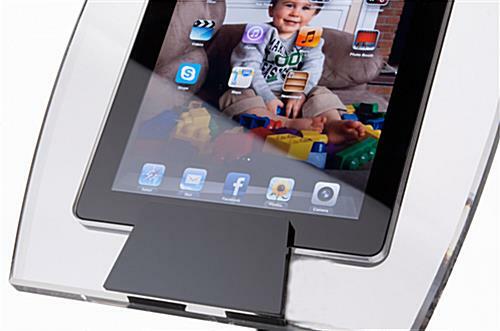 This acrylic stand for ipad allows users to mount the tablet either vertically or horizontally. This display blends into nearly any environment. 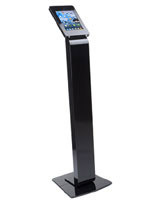 This acrylic stand for ipad that is 49" in height is well suited for the majority of customers. The crystal clear fixture makes the tablet appear as it is floating. 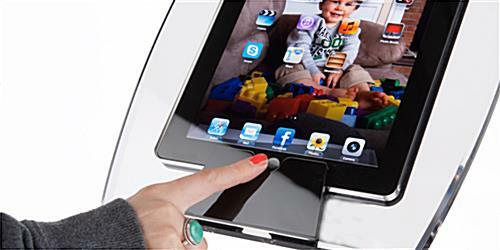 This acrylic stand for ipad has the option of exposing or hiding the tablet home button. These displays can be found in retail stores, tradeshows, banks, and more! This sleek acrylic stand for ipad is certain to draw in customer's attention. This display is ideal for use in busy retail environments in which sales people are often busy with customers and unable to closely monitor the tablet display. Access to the charging port is covered by the stand. 11.9" x 49.0" x 19.0"
10.6" x 12.9" x 1.0"